Spring in Iowa has been refreshing to say the least. Watching the world explode into green and blossoms, while my children excitedly dash outdoors for biking, Morels are an interesting fungi. They appear on forest floors in the spring after rains and warm weather. It is not unusual to see scores of cars parked along roadways that back up to forests, as people are hunting, eager to fill bags with the intriguing honey-comb like mushrooms. True morels have a hollow inside and a stem that connects at the base. 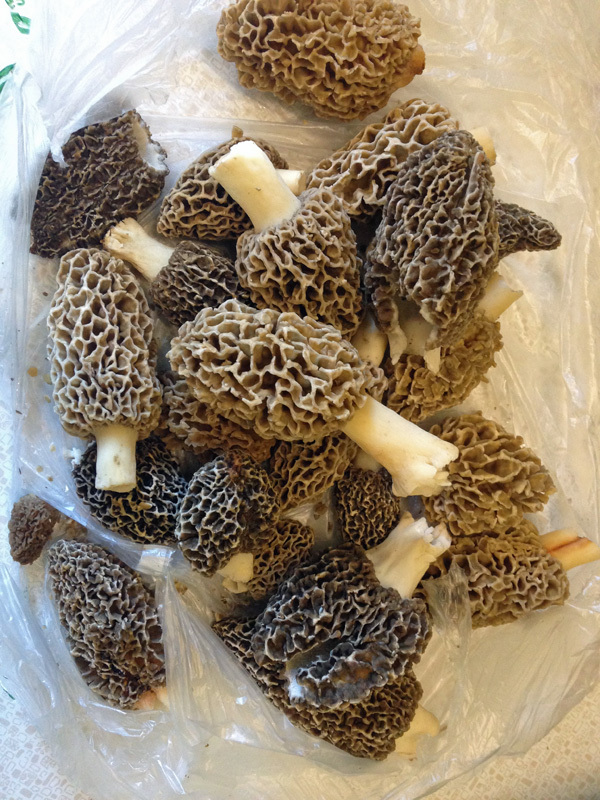 Morels are prized for their flavor and texture, but must be eaten cooked. So, when my parents recently brought me a bag of morel mushrooms they had picked. It has been ages since I have eaten this Midwest delicacy, and I set to work deciding on how to prepare them. I sautéed them in butter with pasta and pesto the first night. 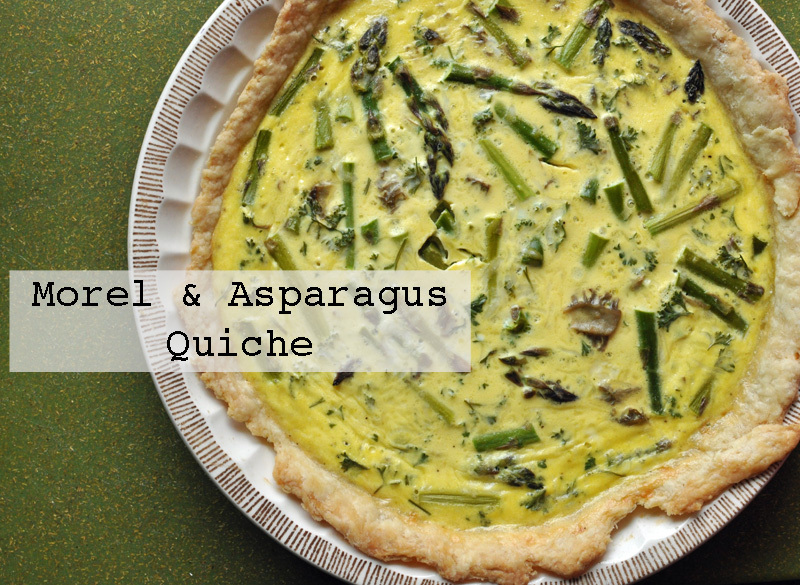 The second night we had them with omelets and the third night I made a heavenly quiche. I started with a single pastry crust. Read my tips on pastry crusts for the perfect crust every time. I have finally freed myself of using a recipe every time I bake a quiche, by measuring the amount of liquid that fits into my pie pan, throwing in the ingredients I want, all while making sure I do not exceed my liquid maximum. My favorite pie pan holds 1 quart, so this recipe creates a filling that is 1 quart in volume. Even though morel season is now over, and I am late on this post, you can swap out the morels for shiitake mushrooms for a similar flavor. 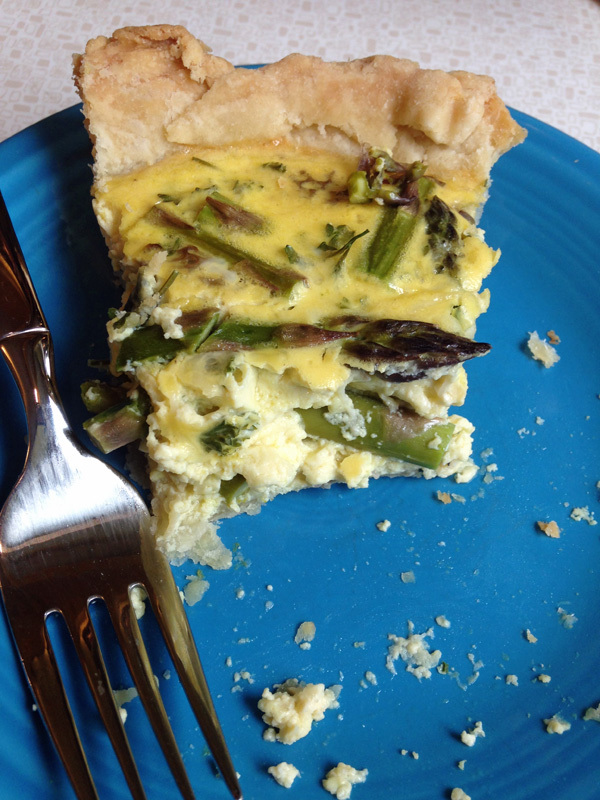 We gobbled up this quiche in no time flat – it’s a perfect texture, moisture level, and density. Enjoy! 1. Using a pastry blender, cut in 1/3 cup butter into 1-1/4 cups flour. Pieces should be pea-sized. Sprinkle 1 tablespoon of ice-cold water over part of the flour mixture; toss with a fork. Push moistened flour to one side of the bowl. Repeat, using 1 tablespoon of the liquid at a time until all the flour is moistened, using 4-5 tablespoons of ice-cold water in all. Form dough into a ball. 1. 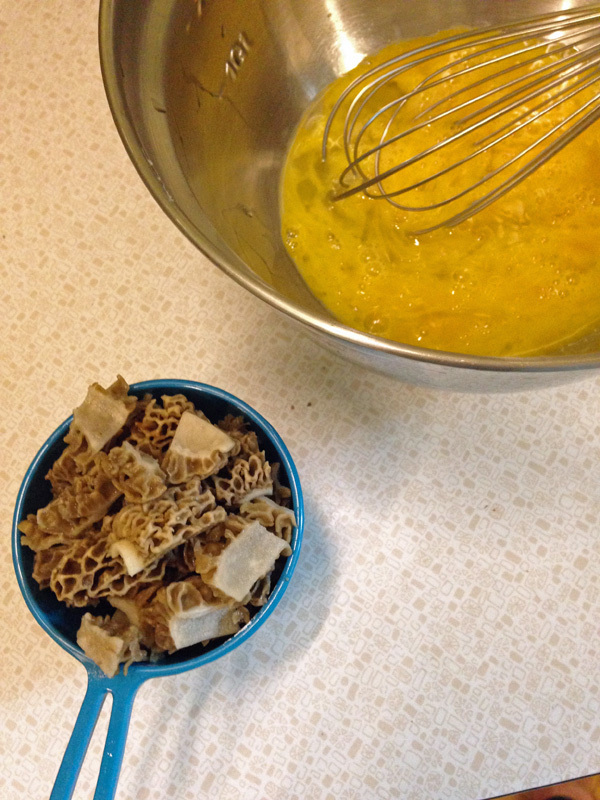 Sauté 1 cup of chopped morels in 1-2 tablespoons of olive oil until softened. Combine in a large mixing bowl with 5 beaten eggs, 1-1/2 cups asparagus, sliced in 1/1/2″ pieces, 1/2 cup milk, 1/2 cup sour cream, 1/2 cup fresh chopped parsley, 1 cup shredded cheese (Italian blend), and salt and pepper to taste. Pour into baked crust and bake in 325° oven for 45 – 50 minutes or until a knife inserted near the center comes out clean. If necessary, cover edges of crust with foil to prevent overbrowning. Let stand for 10 minutes before serving.